The fire service said about 40 firefighters were tackling the blaze covering about 30 hectares. Surrey Fire & Rescue, which is still trying to determine the cause, said it was receiving help from Hampshire, London, West Sussex and Berkshire fire crews. Staple Hill crosses the common and has been closed by police. 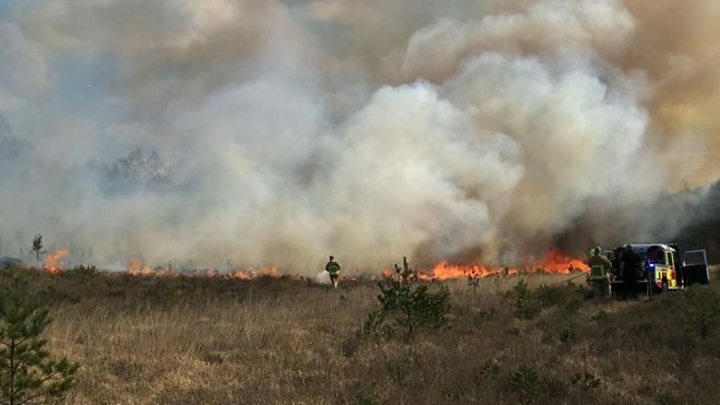 The Thames Basin Heaths Partnership, a project focused on protecting the Thames Basin Heaths Special Protection Area, said: "Our team witnessed this wildfire at Chobham Common National Nature Reserve. "Thanks to their quick action, the fire crews arrived quickly, but fires can grow at a frightening pace." The project said the common was a "very precious and endangered heathland habitat, home to some of Britain's rarest wildlife". Seasonal warden Hannah Needham tweeted it was a "really sad day" for reptiles and invertebrates at the common. As crews continued to tackle the blaze, a yellow wildfire alert was issued for the UK, denoting a moderate risk of wildfires.